Where Do You Intend to Use Your Inverter Generator? What Makes an Inverter Generator Special? When Does an Inverter Generator Top a Conventional Generator? Inverter generators are the best portable power source in many situations, due to their portability, stable power, and convenience. They are useful for their lightweight and quiet performance. We’re here to help guide you in your search for the best inverter generator; showing only the best models on the market. We give unbiased inverter generator reviews, informing you of your choices, and giving you an opportunity to see which inverter generators we liked best. With our comparison chart, reviews, tables, and guides; you will learn everything you need to know about inverter generators, how they work, and how to get the best one. Fuel Type: Gas Capacity: 5.0 gal. Tank Run-Time @ 25% Load: 14 hrs. Noise Level @ 25% Load: 66 dB. We have to give it to the latest and upgraded hit model the Honda EU2200I for its reliability and great performance. After the great success of the Honda EU2000i comes this new model. A Honda GXR120 engine, this portable generator carries more power and weighs less than 47 pounds. It’s the definition of portable. And with less than one-gallon fuel capacity, it’s also fuel-efficient. On a single tank at full capacity runs over 3 hours and at quarter capacity, using 450 watts, runs for over 8 hours. The Honda EU2200I has 2200 watts of starting output and 1800 watts running output. Equipped with multiple power outlets. With advanced inverter technology suitable for powering a range of appliances, including smartphones, laptops, refrigerators, etc. The new Honda EU2200i, packed with a bigger engine, more power, quieter operation, and better overall performance. All with no change in cost or weight. Produces only 48 to 57 decibels of noise depending on the load, which is exceptionally quiet. The Eco-throttle system on this generator, allows the engine to run at an optimum speed according to the acquired load. Guaranteeing efficient fuel consumption at all times. No fuel gauge on this inverter making it hard to know the remaining fuel left in the tank. A durable machine that will serve you for a long time, but comes with a suitable price tag. The Yamaha EF2000iSv2 is a user-friendly and lightweight generator that is great for outdoor use. Maximum power of 2000 starting watts and 1600 constant watts. It uses a load sensing mechanism that allows it to adjust the speed of the engine to match the load for better fuel efficiency and noise control. The gas tank on this machine holds a bit over one gallon and will run for about 10 hours at 25% of the rated load. Produces clean power that is stable, this makes it safe to use with delicate appliances such as mobile phones and digital cameras. It incorporates a new controller, built in the latest technology for easy control and output. There is a fuel gauge on the side for viewing and monitoring the fuel level. Weighs just 44 pounds, it’s as portable as generators can get. In addition, fuel efficient with its fuel economy mode. Durable but a bit on the expensive side. This gas powered inverter generator comes fully assembled. It’s built-in U-shaped foldable handle and it’s rugged tires, are a big boost in user-friendliness as well as ease of use. A generator could hardly be called “portable” at 95 pounds without a method of easy transportation. However, the handle and wheels on this machine fit the bill. 3100 starting watts and 2800 running watts, and runs up to 8 hours on a single tank of gas at 25% load. The Champion Power Equipment 75537i is powerful enough to run a 13500 BTU air condition. With a tank capacity of 6 liters or just over 1.5 gallons, that’s an impressive amount of power. Rated at 58 decibels during operation. This RV ready inverter generator produces quiet, steady, safe power; allowing you to use it with even your most sensitive electronics. The customer service available at this company is also great. Between its ability to run an air conditioner and charge a smartphone, I’d say this machine is as versatile as it is powerful. Easy to use and run with a manual recoil, a push to start electric button, and a wireless remote that works from 80 feet away. Has an economy mode that automatically idles the engine to save fuel. It’s economy mode definitely helps with its gas efficiency. It’s a heavy machine compared to other generators of the same power output. The Westinghouse iGen2200, a four-stroke powerful engine. Plug-and-Play portable power, rated at 2200 starting watts and 1800 running watts. A 1.2 gallon tank of gas allows it to run up to 12 hours at a 25% of the rated load. It’s also parallel capable, just plug it with a parallel connector to another iGen series unit for more power. The iGen2200 offers a variety of features at a great value. Utilizing a double-insulated enclosure, asymmetrical fans, and dual quiet mufflers to reduce the noise level during operation. Rated at 52 dB when at quarter load. Features two 120V household outlets and two 5V USB ports. Produces stable, high-quality energy making it safe to use with sensitive electronic devices. Has a spark arrestor and it’s CARB compliant. Weighs 46 pounds, quiet and compact design with a built-in suitcase-style handle, easy to transport and carry. 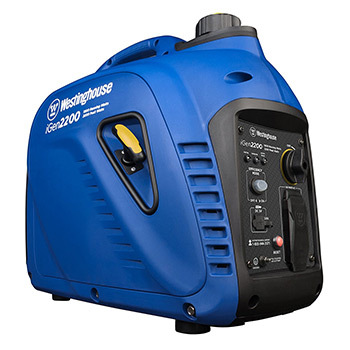 The Westinghouse iGen2200 portable inverter generator, a great option for camping, tailgating, small projects around the house, and situations where you need efficiency and less disruption. Easy to use with a convenient overload protected panel. Designed to automatically adjust its speed to produce only the amount of power needed. Increasing fuel efficiency while limiting exhaust emissions and reducing noise level during operation. Lacks wheels for easier storing and transporting. The WEN 56310 inverter generator produces 3100 starting watts and 2800 running watts. Designed to produce stable and clean energy limiting its total harmonic distortion to only 1.2% at full load, making it safe to use with sensitive electronics such as laptops and cellphones or any vulnerable electronics. Has an Eco-mode switch which maximizes its fuel consumption by allowing the motor to automatically adjust its speed to match the required load. In addition, it allows for longer engine life and quiet operation. Weighs almost 82 pounds but the built-in wheels and collapsible handle allow for easy portability. It’s also parallel capable, easily connect two of such units for double the power. Fully-packed overload protected safeguard panel. Low-oil and low-fuel automatic shutdown, which prevents the engine as well as any connected appliances from damage, along with light indicators and a fuel gauge. It’s also CARB compliant. The WEN 56310 is a great option for long use in camping grounds, tailgating events, and can keep your critical appliances at home running in the event of a power outage. A powerful and fuel-efficient engine with a long runtime. Has a gas tank of 1.85-gallon that allows it to run over 7.5 hours at 50% of the rated load. It’s also relatively quiet for its size, rated at 57 decibels when at quarter load. The Eco-mode is good for only loads under 1000 watts. 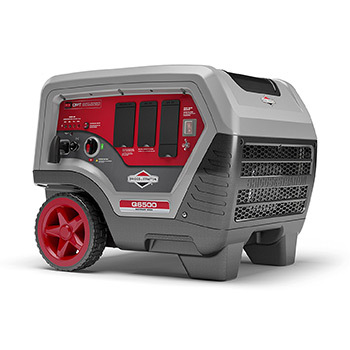 Designed primarily for home backup power needs, comes Briggs & Stratton Q6500 inverter generator. Joins our list of best inverter generators as it carries a lot of power when compared to other inverters. A 6500W starting power and a 5000W continuous power. Built to give you reliable power during emergency outages. Enough for vital home appliances, including sensitive electronics. A 5 gallon gas tank that provides a 14 hour runtime at 25% load. Equipped with a fuel gauge and a power usage meter. The incorporated inverter technology allows it to produce clean and stable electricity, with 3-6% total harmonic distortion. The Briggs & Stratton Q6500 has a highly efficient system that automatically adjusts the engine speed based on the output power. Saving fuel as well as reducing the noise level during operation. 23 feet away and its noise level is at 66 decibels at 25% load. A cost-effective choice for inverter generators with huge power. The incorporated LED indicators for added safety. It does not have an electric start. For a 240 volts RV outlet, this generator produce only 4800 watts. Engine Displacement (cc): 121 cc. 79 cc. 171 cc. 79 cc. 212 cc. 306 cc. You’ve made the choice of which type of portable power source best fit your needs. Whew! But now you’re trying to decide on which is the best portable inverter generator. The decision can be easy, you just need to answer a few questions that will help you narrow down all the inverter generators on the market to just one that is suitable for you. If you’re reading this, you’re the type of person who wants to have all of the information in front of them before making a purchasing decision. In that case, consider the following as you narrow your choices. Believe it or not, deciding on your power requirements and where you intend to use your generator is important. Each place you intend to use your inverter generator can influence which one you’ll want to purchase. 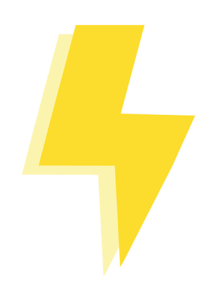 Home Back-up Power: This comes down to what you need to power in an outage event. If you just need your phone and a coffee pot, something as small as 1000 watts will suffice. However, if you need to power your electric garage door and sump pump; you’re going to need something much bigger. RVs and Cabins: For an extended off-grid living, you will want an inverter generator capable of running at 2000 watts or higher. Running your entertainment devices and appliances simultaneously requires quite a bit of power. There is another feature you may find necessary is the ability to link two or more inverter generators together; allowing you to still have the portability of an inverter generator while achieving higher power output. Camping: You need to decide what you want to power and for how long when buying a portable power source for camping. A lot of times you won’t need a very big power source for camping; as there isn’t much that needs electricity in the middle of the woods. A 1000 watts or less should be ideal. The majority of inverter generators will have a 0.5 to 2.0 liter of a gas tank. When it comes to runtime, portable power sources have a bit of a trade-off. More run time means a bigger gas tank means less portability. More portability means less gas tank and less run time. So weigh out your options, and if given a few pounds difference over runtime, always take the runtime. With portable power sources including inverter generators, portability means different things to different people; some want to be able to lift their power source, while some will trade weight for more power and wheels. Choosing what kind of portability you want, and what you’re willing to give up in exchange for that, is important. Personally, I would trade the ability to carry my inverter generator for being able to run my electronics longer, but it all goes down to personal preference. While inverter generators are significantly more quiet than regular generators. However, there is a big difference between one machine and the other. As a result, it’s important to look at the noise rating of the inverter generators on your list. While that may not be a deciding factor in your purchase, it’s definitely something to keep in mind. 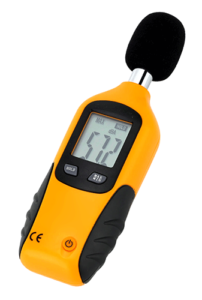 You can measure noise in decibel (dB) for portable power machines. And anything above 60 decibels at 50% load for an inverter generator is higher than average. If you’ve already decided on an inverter generator as your portable power source of choice, then I’m sure you’ve seen their cost. Inverter generators are more on the expensive side than conventional generators. But an inverter generator is a much more versatile, much better quality, and in many cases, much easier to use portable power source. The price of owning an inverter generator is a bit higher than owning a regular generator. But as shown by the steady increase of popularity that these portable inverters have achieved, many people are deciding that they’re worth it. Be aware of industry jargon, and only focus on the specifications of each machine. If you were selling a cake, you would say it was the best cake ever, even if it wasn’t. Get a machine manufactured by a well-known company. If you look all over and no one has heard of the company – don’t purchase from them. Make sure you get a good warranty. If two machines match your needs, then check the warranty. The one with the best warranty is always the best choice. A warranty is a great sign of how a company feels about their product. Price check. Check around and see if the price you’re getting is really the price that you should be paying for. Usually, buying online will save you money. Now, you’ve decided on the features that are important to you, what you need to power; as a result, the size of the inverter generator you need, what a reasonable noise level is, and lastly which inverter fits within your budget. The only thing left is buying one. The biggest thing to keep in mind as you make your choice is that while there are many great options out there, no one can say which one is ‘best’; because the best inverter generator for me could be annoying and inconvenient for you, and vice versa. 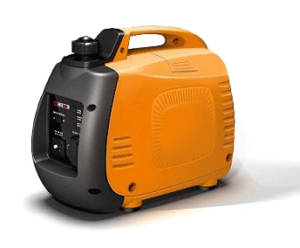 To get the best performance from your portable generator, you can check our list of the most useful accessories for a portable generator. The terms ‘generator’, ‘power inverter’, and ‘inverter generator’ are commonly used, but there are marked differences between these machines and their functions and abilities. To know what makes an inverter generator different from both inverters and regular generators. We’ll need to take a look at what each of them does. A generator is a fuel powered motor attached to an alternator and that produces electricity. The motor of a generator has to run at a constant speed to be able to produce the current required. 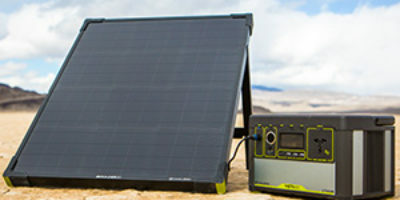 An inverter draws power from a fixed DC source, such as a car battery or through solar power, and uses electric circuitry to ‘invert’ the DC power; creating AC power. Inverter generators use a 3-phase system. They create AC power like their generator counterparts, but then that power is converted to DC, and then ‘inverted’ to create pure sine wave electricity. 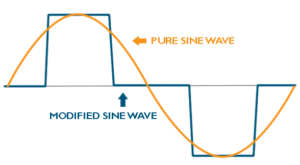 Sine wave energy is considered superior to the regular energy common with generators. Primarily because sine wave energy doesn’t experience the spikes and dips in current that happens in regular generators. This makes it safer to use inverter generators with sensitive electronics, such as your digital cameras, smartphones, and sound systems. Inverter generators are uniquely useful when compared to regular generators and inverters, and have many advantages not found in their counterparts. When looking for a portable power source, there are key features to look for, and an inverter generator is many times more likely to fit your portable power needs. Many times, when searching for a portable power source; you’re looking for something versatile, and often for something to use as a backup power source for your home or a portable power source for camping, RV’s and cabins. All of these usages have one thing in common; you’re going to power sensitive electronic devices, such as laptops, phones, tablets, GPS navigation system, and so on. Using a regular generator poses an innate risk to these types of electronics; due to the unstable nature of the power regular generators produce. Making inverter generators much safer to use due to their power quality. In this age of instant gratification and the constant search for convenience, inverter generators make more sense to own when compared to inverters and generators. They have their own power storage system (battery), they’re safe to use with sensitive electronics, such as computers and tablets. So, you don’t have to worry about damaging them, and they don’t need special conditions to run (such as solar panels, in the case of inverters). Many of us know that convenience comes at a cost, and the same is true for inverter generators. Possibly the only disadvantage of an inverter generator, as opposed to a generator or inverter, is the purchase price tag. The cost of inverter generators usually tends to be higher than conventional generators. However, they carry distinctive characteristics, that makes them worth the higher price tag. At the end of the day, only you can decide if an inverter generator is the right portable power source for you. But with convenience and features available with inverter generators, they are becoming the preferred source of portable power. Conventional generators and inverter generators both have their place in the world of portable power machines. With our inverter generator reviews, you’re able to see which ones are the best in their class. But even the top-rated inverter generator can’t take the place of a conventional generator in some cases, and vice versa. That leaves us with the question, “When does an inverter generator top a conventional generator?” To answer that, we need to check the difference between the two. Inverter generators vs. conventional generators. The general makeup of a generator, a fossil fuel driven motor wired to an alternator. Once the alternator is running, it produces electricity, similar to the way the engine and alternator work in your car. But the motor of a conventional generator has to run at a consistent speed, for it to produce the current required to run AC electronics. Conventional generators come in enormous sizes, upwards of ten thousand watts for commercial models. To put it in perspective; a commercial generator can be big enough to power your entire house, fridge, flat-screen, PlayStation and all. Inverter generators are a bit more complicated than conventional generators; they use a 3-phase system. As with generators, inverter generators create AC power. But that’s where the similarities end. Inverter generators then convert the power to DC, which may seem a bit counter-intuitive. Once the power is in DC form; they invert that power to create sine wave energy – a much more stable type of power. Sine wave energy is considered a much more stable form of electricity. But inverter generators only get so big, typically maxing out at under 6000 watts. Features are going to prove the main difference between inverter generators and conventional generators. Size: Inverter generators make portability a primary manufacturing goal. And are often found in sizes around 24 x 13 x 15 inches, some can be bigger, some smaller, but they average around this size. Conventional generators lack the convenience of their smaller counterparts. Weight: It’s not unusual to find inverter generators under 75 pounds, sometimes much lighter. While you can find small open frame generators, inverter generators are most often lighter. Fuel: While generators typically have larger tanks, inverter generators are much more fuel-efficient; due to their ability to automatically adjust output based on load. Noise: This is probably the biggest functional difference between these two types of machines. 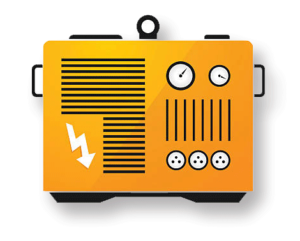 The average inverter generator is rated about 61 decibels at full load. To compare, an electric razor is rated at 68. Can you imagine? Alternately, conventional generators are rated at 65-75 decibels – the same range where jet engines are listed. This matters for many reasons, not the least because that level of noise constantly running could be intolerable. Power Output: Generators come in almost any size you can imagine; from a few hundred watts to over fifty thousand. Most inverter generators tap-out at under six thousand watts. 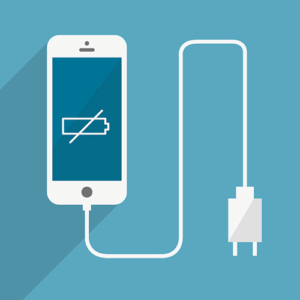 Type of Power: In the age of smartphones and computers; our precious electronics are often the reason we buy backup power equipment or portable power equipment for camping. As we discussed above, generators experience a lot of dips and surges in their power output. Whereas inverter generators provide a constant and consistent output of power. The result is that charging your smartphone with a conventional generator could fry its sensitive battery; where on the other hand, charging it with an inverter generator is safe. Camping: An inverter generator can quietly power the devices you need to run. RVing: You will need something quiet because most campsites have enforced noise restrictions between certain hours of the night. Cabin: You’re probably going to want to plug in your phone, laptop, or portable electric stove, whether you’re in your cabin or boat. You wouldn’t want to listen to the ever-present roar of a generator. Emergency Backup: You will need a stable, quiet power source to power a few basic electronic devices and appliances. Unless you have a need for a large source of power, an inverter generator is nearly always the best route to go. It provides the quiet, stable, safe electricity you need in the most efficient way possible. They’re easy to transport, highly portable, and need very little monitoring. Our inverter generator reviews cover the features and benefits of different models and sizes; allowing you to find the best portable inverter for your needs. There is a fairly recent advancement in portable power sources. We’ve narrowed the vast list of inverter generators down to only the top of their class. We’ve done the work of finding and comparing the best inverter generator models from multiple companies and brands. And have chosen to only review the best portable inverter generators in the market, covering the features and benefits of different models and sizes. With our guide, comparison charts, and inverter generator reviews, you should have no problem identifying your power needs, discovering the features you want; and at the end, deciding on which inverter generator most suitable for you. I was told that in order to run computers TV’s you need a inverter generator. Because I have central air unit I would need a 11000 watt generator as I want to use propane. but I can’t seem to find one. Can you help me. Unfortunately the largest units for inverter generators max out at 6500 watts. So the other option is to choose one of the parallel capable inverter generators to maximize your watts.